Bird control spikes, also known as anti-roosting spikes, are an effective method for deterring birds from roosting including pigeons, vultures, small seagulls, and crows. Spikes are not effective for smaller birds such as sparrows. But not all bird spikes are alike. 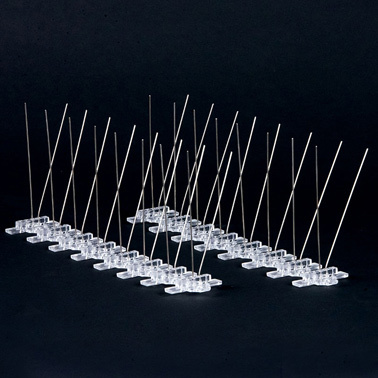 Hot Foot Rite Spikes are made with a UV-resistant clear plastic base and stainless steel prongs. 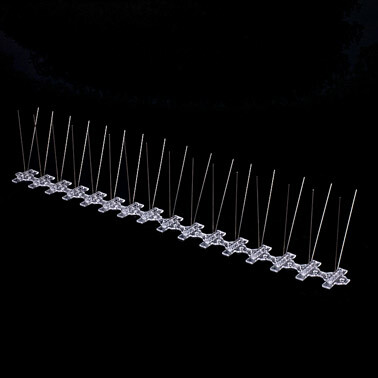 Hot Foot Rite Spikes are also very easy to install. The UV-resistant clear plastic base can be screwed, nailed, secured with Hot Foot adhesives, or clamped into place with snap-off sections every 1.5". The base itself is extremely flexible as well so you can bend it to mold with curved surfaces. Great for building façades, ledges, rafters, top of signs, rooftops, rain gutters, on lights and CCTV cameras, along the tops of walls, and more. Available in four different models depending on the width of roosting area you are trying to protect. 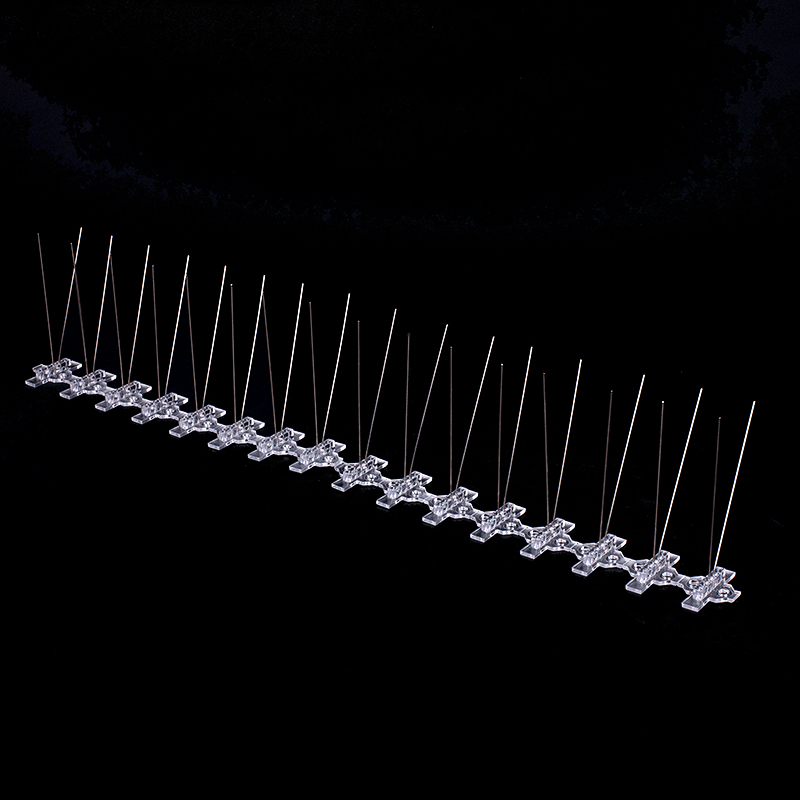 Rite Spike 2 Prong protects up to 4" of surface. 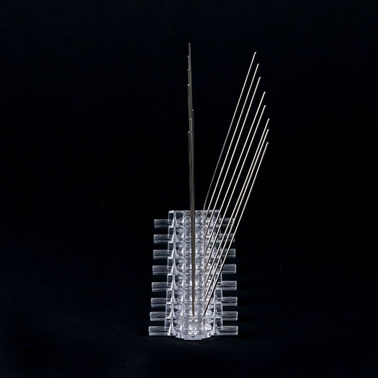 Hot Foot Rite Spikes are an easy, cost-effective, and humane way to permanently deter birds from roosting on or in commercial, industrial, and residential structures. 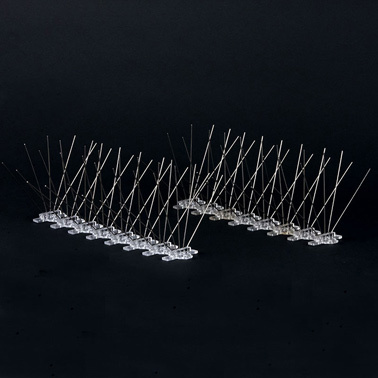 Pre-clean the surface where spikes are to be applied using a good household cleaner and sanitizer to kill virus and bacteria present in bird droppings. Hot Foot recommends its own product called "Steriliz It" as this is EPA registered and contains a small amount of detergent to help dissolve the fatty acids and also a true odor neutralizer. It is absolutely essential to remove bird nests, nesting debris and the odors of bird nesting areas as these are powerful incentives for the birds to return. Remove overhanging branches etc from trees otherwise leaves, twigs etc can drop down into the spikes after installation and allow birds to penetrate and nest again. 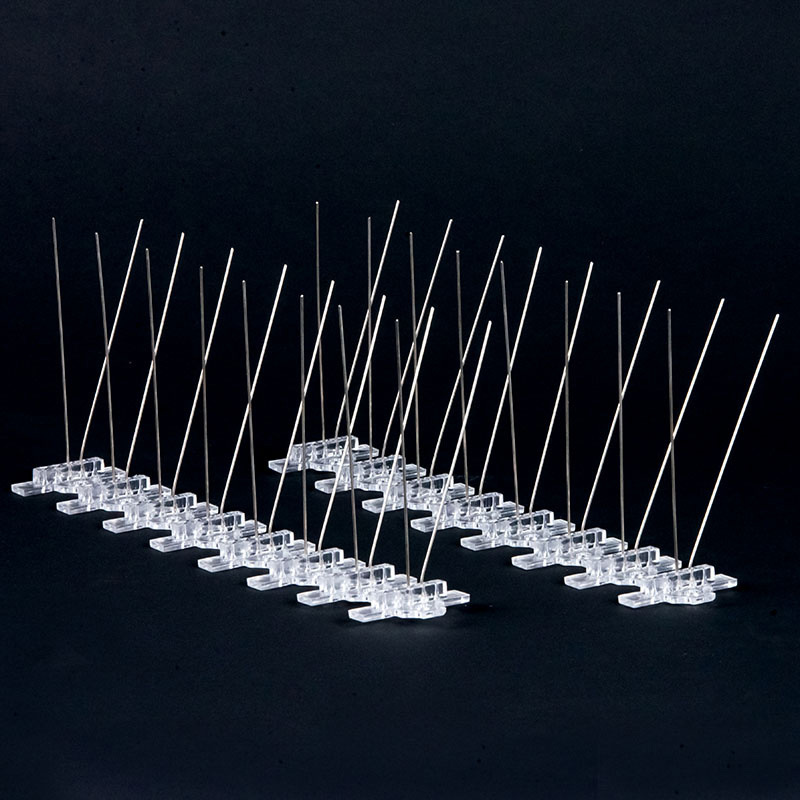 Hot Foot Rite Spikes will only repel pigeons and similar sized large birds where applied. In all cases when using screws it is advised to seal any holes or surface penetrations with a good quality silicone to prevent water ingress. Extrude a bead of outdoor adhesive such as Hot Foot E6100 to the underside of the base, along the center line. Carefully place spike onto desired location making sure that on ledges or parapets the outer prong is level with the outer edge. There should be no more than a 2" gap between the last prong and the rear wall or window of the ledge. If a larger gap exists then install another row of spikes for total coverage. Ideally use a permanent attachment such as a screw/anchor in addition to the adhesive. For sheet metal surfaces use a sheet metal screw placed through the holes on the base with a washer. If the head of the sheet metal screw is too small then use a 3/8" washer to pass the screw through. If using an adhesive then follow the instructions above. A longer lasting and permanent installation can be achieved by inserting a wood screw through one of the holes on the base, use a suitable washer (3/8") and tighten firmly. Use one screw per 1ft piece or 2 screws per 2ft piece. Use Hot Foot E6100 adhesive and follow the instructions above for Masonry or Metal. Use Hot Foot E6100 adhesive and follow the instructions above for Masonry or Metal. If a stronger and more permanent installation is desired into stucco then take a ¼" x 1" cone anchor and insert into the stucco in line with one of the holes in the base of the spikes. Take a suitably sized washer (3/8") and through this pass a screw which is ¼" x 7/8" and screw firmly in place. Use one screw per 1ft piece or 2 screws per 2ft piece. Into GFRC take a white "sheetrock anchor which can be inserted to a depth of at least 1" and purchase the appropriate sheet metal screw with that anchor. Screw the sheetrock anchor into the GFRC in line with one of the holes in the base of the spike and, placing an appropriate washer over that hole (3/8") pass the sheet metal screw through and screw into the hole in the top of the sheetrock anchor. For specific advice contact Hot Foot on 1 800 533 8421 or email.